Easter baskets have been a tradition for as long as I can remember in my family, as I'm sure they are in most. Growing up my parents would hide our baskets around the house and we would have to hunt to find them. They were always stuffed to the brim with brightly colored plastic grasses, malted robins eggs, gummy chicks and bunnies, jelly beans, and the all important chocolate Easter bunny (all of this proved to be a bit of a problem one Easter Sunday when my dad hid my little brothers basket in the freezer. As the frozen candy thawed, the sugars melted and formed a sticky sweet mess that fused together in on sugary lump. Moral of the story? Freezers are not an appropriate hiding place for candy-filled Easter Baskets). Never one to care too much for the sugar candy, the real star of the Easter basket show was always the chocolate bunny. When I was little, all that really mattered to me was that the bunny was big and colorful. 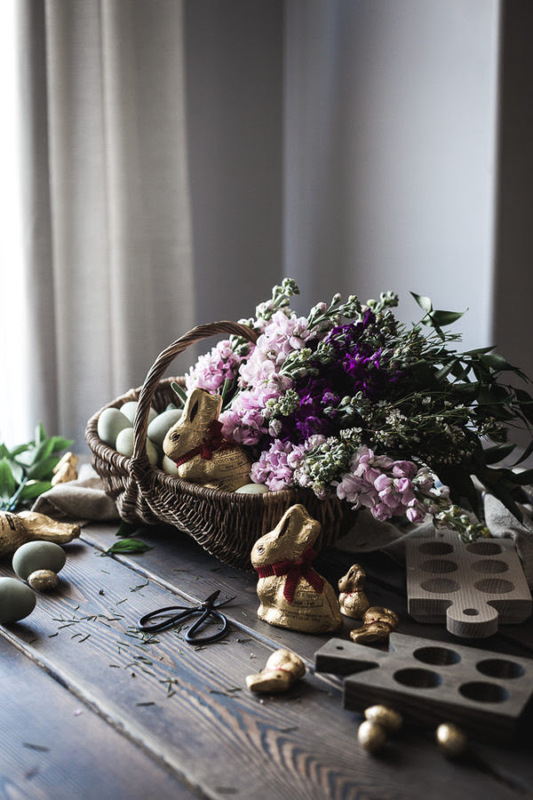 I still love the chocolate bunny and it's always the first thing that goes into my children's baskets. But over time, my chocolate bunny tastes have become a bit more refined and now Lindt GOLD BUNNY are the only ones that fit the bill. 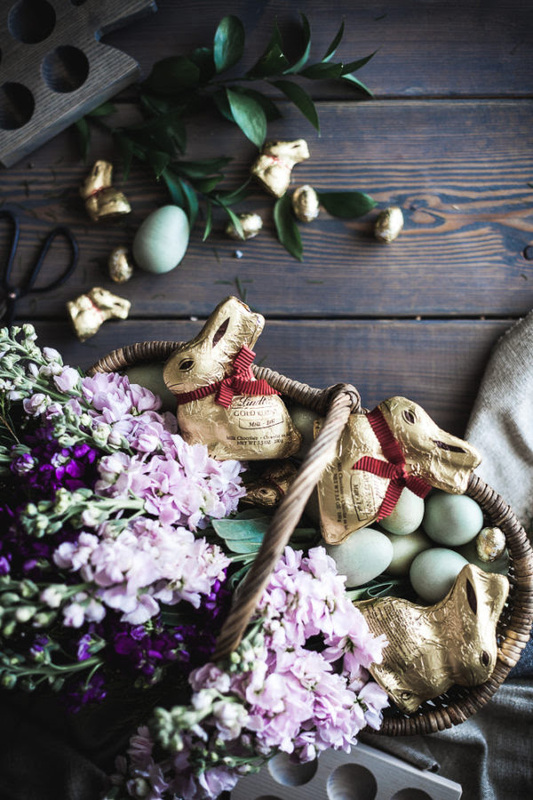 What could be better than my favorite brand of chocolate in the shape of a bunny and all wrapped up in golden foil with a beautiful red ribbon? This year I'm making a grown-up basket so that I can relive the glory days. Only this time I'm forgoing the brightly colored basket in favor of a beautifully weaved French apple basket, the tangle of plastic grass for a bundle of fragrant flowers, the candies and toys for lovely pastel Araucana eggs and little wooden egg boards, and, of course, replacing that waxy, cheapy chocolate bunny with an elegant, gold wrapped Lindt GOLD BUNNY. And a bunch of Lindt MINI CHOCOLATE BUNNY chocolates because, uh, adorable. This may be my best Easter ever.